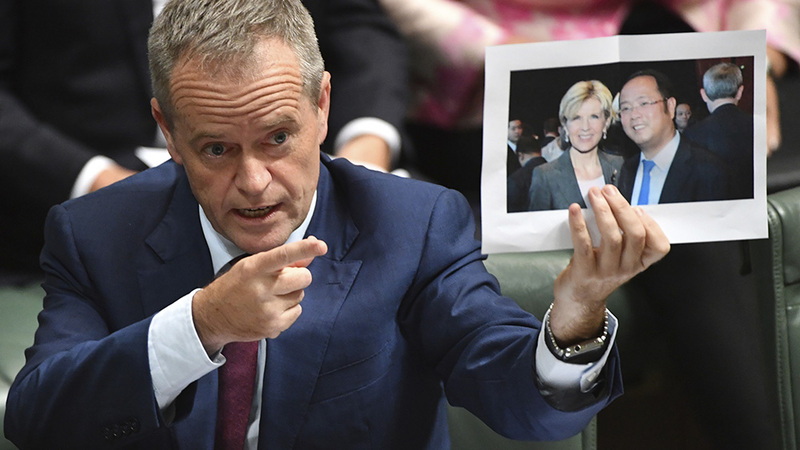 Leader of the opposition party Bill Shorten holds a photograph of then-Minister for Foreign Affairs Julie Bishop and Chinese businessman Huang Xiangmo in the House of Representatives at Parliament House in Canberra, Australia, June 14, 2017. Free World 10 - Commie countries 0. This is a wise move made by Australia. It's not a joke when it comes to spies affairs by the over-seas Chinese or by any former citizens of communist countries. Almost all Laotians, Vietnamese and Combodians who fled their countries to settle down in Australia are now working for the benefit of their former motherlands.They betrayed Austalia so you must keep a close look at these Traitors. I'm sure you know how to treat them.